The BlackBerry KEYone which was unveiled a few days ago at the MWC 2017, may not be the last phone from the Canadian OEM. A couple of new photos of a device made by PT BB Merah Putih in Indonesia, gives us the first look at a device which is code named, BBC100-1. The above phone is apparently a mid-range device, made by the joint venture, specifically for the Indonesian market. CrackBerry which reported the leak, says that the device has been certified in the Country, which in turn suggests that the device may be launched quite soon. In terms of technical specifications, the BBC100-1 will reportedly sport a 5.5-inch 720p HD display, and will be powered by a Qualcomm Snapdragon 425 processor, which is clocked at 1.4 GHz along with 4GB iof RAM. The phone will have 32GB of internal storage, and will support dual-SIM cards. The device will be backed by a 3,000 mAh battery. 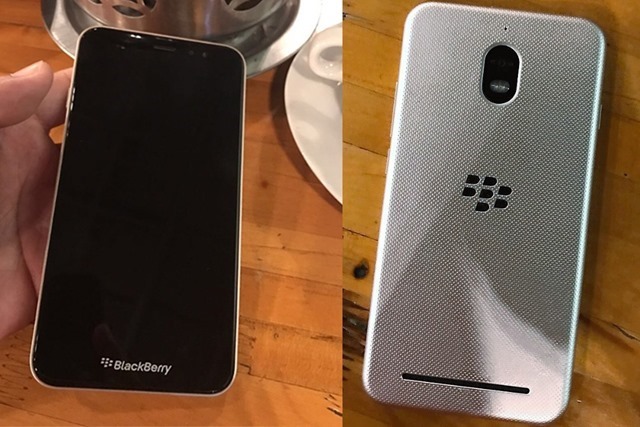 The upcoming BlackBerry phone seems to have a metal unibody, with a rear placed speaker, Dual LED Flash. We can see the BlackBerry logo, below the display, as well as on the back panel. Speaking of which, the phone’s rear panel seems to have some sort of textured metal finish. No fingerprint scanner can be seen in the photos, and perhaps it was skipped to keep the device within a budget friendly range.